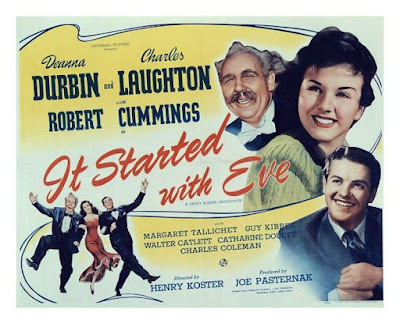 It Started with Eve (1941) is a romantic comedy starring Deanna Durbin, Charles Laughton, and Robert Cummings. Cummings is Johnny Reynolds, the son of millionaire Jonathan Reynolds (Laughton) who is on his deathbed. Johnny’s father’s one wish is that he would get to see his son’s fiance, Gloria Pennington (Margaret Tallichet) before he dies. When Johnny discovers that Gloria and her mother are not at their hotel, he asks hatcheck girl Anne Terry (Durbin) to pretend to be his fiance for the evening. Things get complicated when the elder Reynolds has a “miraculous” recovery and Johnny scrambles to explain to his fiancee that Anne means nothing to him. Then there’s his father who has taken an immediate liking to Anne. Anne is an aspiring opera singer who hopes to get to sing at a party that Jonathan is planning to introduce his "future daughter-in-law" to his influential friends and associates. Will Johnny be able to fool his father long enough so that Anne gets her big break? 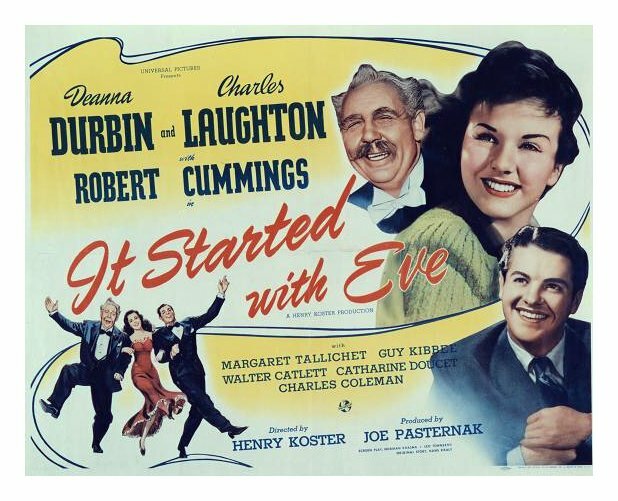 Durbin was one of the highest paid movie actress in the world when It Started with Eve was released. This film is considered one of her best, in a film career that saw the actress headline 21 movies from 1936 to 1948. New York Times critic Bosley Crowther lauded the film and the performances of Laughton and Durbin. He said, “Miss Durbin is as refreshing and pretty as she has ever been and sings three assorted songs—including a Tchaikovsky waltz—with lively charm.” Durbin and Laughton became great friends during filming. They made another movie together, Because of Him in 1946.